An adaptive bike for Levi would benefit him socially and physically. He’s the oldest of our quadruplets. They are at an age where they want to be on the move all the time. Having a bike would help Levi keep up with his three siblings and friends. Studies have shown how important inclusiveness is for kids with special needs. The Rifton bike would allow for inclusive play and give Levi self-confidence to do things on his own. The adaptive bike would also help Levi meet goals for physical therapy. Each time Levi furthers his physical ability he gets closer to walking independently. The pedaling motion of the bike would strengthen his hips and knees, especially into extension. 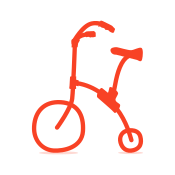 In addition, a bike requires the user to straighten one leg while bending the other. Because of Levi’s tone this is difficult for him. Using an adaptive bike would allow him to practice this skill receptively which would benefit his progress with walking. Finally, a bike would provide him with cardiovascular exercise, which has many beneficial health effects. Born 3 months premature with two brain bleeds, Levi - or Levi Guy as we affectionately call him - is the oldest of our quadruplets. 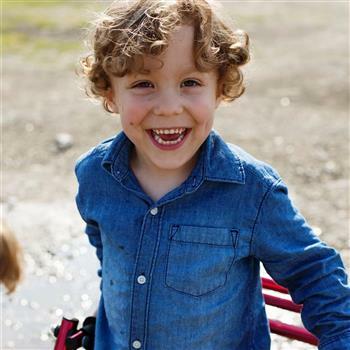 Now a charismatic five-year-old, his cerebral palsy doesn’t define him - his mighty spirit does. Multiple therapists are impressed with how much he’s overcome and attribute it to his determination and family support, as he juggles OT, PT, Speech, CP clinic, swim lessons and preschool. Levi not only works hard, but he plays hard too with a lovable, silly personality. His bold laugh is legendary and his hugs should be patented. Especially since he has a tag line for them, “Knock, Knock - Levi Huggies are here!” Levi wants to be a firefighter one day and his love of all things related to firefighting is unmatched. His walker and crutches are named after firetrucks from his favorite show Fireman Sam. As he grows, so does the gap between what his siblings and peers can do physically. Being able to have an adaptive bike would help him reach physical goals as well as keep up with his siblings and friends. Please consider helping Levi win an adaptive bike by voting or donating. An adaptive bike for Levi would benefit him socially and physically. He’s the oldest of our quadruplets. They are at an age where they want to be on the move all the time. Having a bike would help Levi keep up with his three siblings and friends. Studies have shown how important inclusiveness is for kids with special needs. The Rifton bike would allow for inclusive play and give Levi self-confidence to do things on his own. The adaptive bike would also help Levi meet goals for physical therapy. Levi is Jacks classmate and friend we are happy to help. Go Levi! Can’t wait to see him with his new bike! May God bless your Quadruplets.